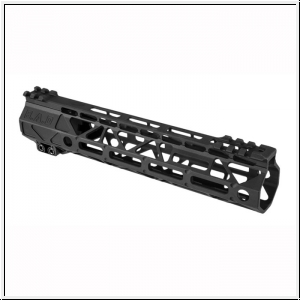 Battle Arms Development’s Rigidrail M-LOK Handguard is designed to give you just the right balance between weight, strength, and accessory mounting versatility. Its open, skeletonized configuration enables fast, thorough dissipation of barrel heat, even during long rapid-fire operations (but you’ll probably want to wear gloves!). M-LOK slots at 3, 6, 9 and 12 o’clock positions open up plenty of accessory mounting options. Short Picatinny rail sections positioned along the top at the front and rear give you mounting points for backup sights or other accessories. The Battle Arms Development Rigidrail M-LOK Handguard allows the barrel to free-float, so it will not apply any accuracy-compromising stress to the barrel. Machined 6061 T6 aluminum construction for superb strength - Tough, non-reflective hardcoat anodized finish for added surface strength Four (front/rear pairs on each side) anti-rotational QD sling swivel sockets Comes with proprietary nut (wrench included) machined from extra-strong 7075 aluminum Bronze barrel nut finish provides a unique visual contrast visible through the Rigidrail’s open latticework No barrel nut shims required With a generous 1.315" I.D., the Battle Arms Development Rigidrail M-LOK Handguard has clearance for most low-profile gas blocks and will not make contact with the gas tube. It even has a tapped hole at the 6 o'clock position on the forward underside for mounting a bipod or additional sling attachment point.